Saint Avit Loisirs is a stunning 5 star family friendly campsite that’s located within the heart of the Dordogne countryside a short distance from Le Bugue at Saint-Avit-de-Vialard. The campsite is considered to be one of the Dordogne’s premier campsites and it’s not hard to understand why. 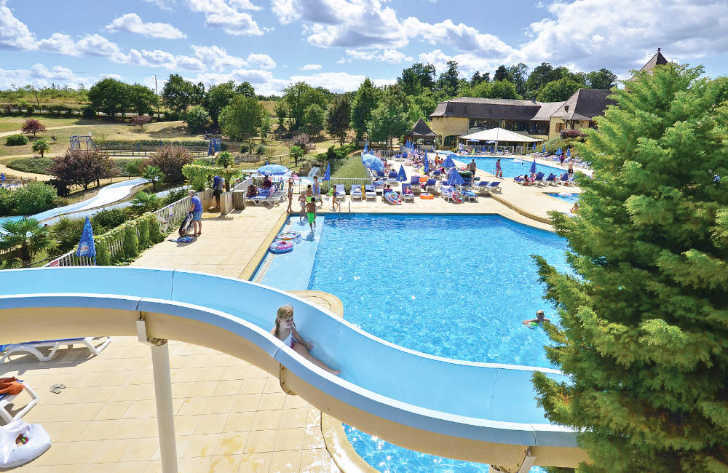 Located deep in the beautiful, wooded Dordogne countryside, Saint Avit Loisirs has won top awards not only for its brilliant location but also for the outstanding range of activities and facilities the are available on-site. One of the great things about the campsite is the way it’s been designed.Traditional Dordogne farm buildings are home to many of the campsites facilities, the pitches are separated by trees, bushes and plants that provide shade from the sun and privacy and there’s plenty of outside space where children can just play and have fun. The nearby town of Le Bugue is reached within minutes of leaving the campsite by car and has everything you could possibly want. A pleasant shopping street, supermarket and weekly market selling locally produced goods are all present. One of the most impressive things about Saint Avit Loisirs is its stunning swimming pool complex. Boasting six swimming pools including an indoor pool, 2 children’s pools, a variety of water slides, a lazy river, jacuzzi and to top it off a water jet park which is perfect for children with a variety of different colourful jets and games. Those wanting to kick back and relax when the children are splashing around in the pool can enjoy the sun terrace around the pools, a large grassy sun terrace or the bar terrace which overlooks the swimming pool. Saint Avit Loisirs really is the perfect choice for those looking for a great family campsite in France. A stunning location, great facilities, superb activities, a wonderful pool complex and lots of activities nearby await visitors to this brilliant campsite. Saint Avit Loisirs campsite offers a comprehensive selection of activities and facilities on site and also nearby to ensure you have a fantastic family holiday. On-site activities at Saint Avit Loisirs campsite include tennis, table tennis, football, badminton, basketball, volleyball, gym, quad bikes, boules, driving range, fishing, mini golf, trampolines, playground and cycle hire. Facilities available at Saint Avit Loisirs campsite include WIFI, restaurant, takeaway, bar, groceries, games room, tv room, animation team, washers and dryers. Accommodation at Saint Avit Loisirs campsite includes a range of 2 and 3 bedroom mobile homes and tents that are available from Eurocamp.